Who has the right to determine what’s appropriate to safeguard the right to vote? Is it a Congress comprised of representatives of the people, with full fact-finding authority, which in 2005-06 “held 21 hearings, heard from scores of witnesses, received a number of investigative reports and other written documentation of continuing discrimination in covered jurisdictions… [compiling] more than 15,000 pages” of evidence for the legislative record, and passed Voting Rights Act reauthorization by lopsided bipartisan majorities of 98-0 in the Senate and 390-33 in the House? No, apparently, it’s a conservative activist Supreme Court, which in its 5-4 decision today determined that Congress’ 2006 reauthorization of the Voting Rights Act did not adequately reflect current conditions and unconstitutionally infringed on states’ rights to regulate their own elections. Equal “dignity” for the states, a bare majority holds, matters more than equal protection for their voters. Read the entire article for a comprehensive explanation of the ruling. 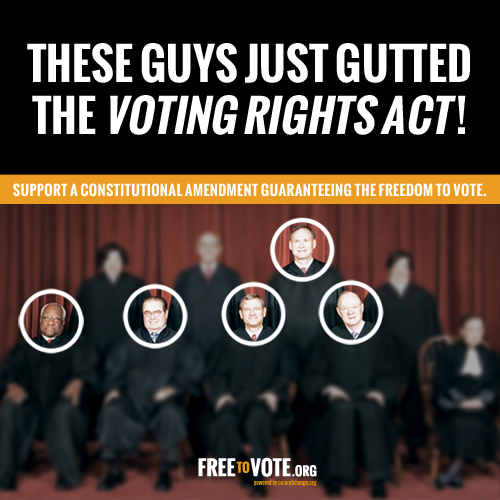 This entry was posted in Uncategorized and tagged Section 4, Supreme Court, Voting Rights Act. Bookmark the permalink.